Salvation And Survival: What Does It Mean To Be "Spiritual"
What Does It Mean To Be "Spiritual"
How many times have you heard someone say that they prefer to be called "spiritual" rather than religious, or a Christian, or even a believer in Jesus Christ? This is a term that I frankly think has been abused and misused, diminishing the true sense of the word. I mean, let's be honest ... in its proper sense it denotes the Holy Spirit, and that's a pretty high standard to meet if one is going to call oneself spiritual. I agree that it is a state that, in its proper understanding, we should aspire to for the good of the Body of Christ. In Galatians 6:1, Paul tells us "if anyone is caught in any transgression, you who are spiritual should restore him in a spirit of gentleness". But that instruction comes with a warning ... "Keep watch on yourself, lest you too be tempted". And lest we humans think the term belongs solely to us in this world, let me remind you of Paul's exhortation in Ephesians 6:12, that we fight against "spiritual hosts of wickedness in the heavenly places". Other translations say, "spiritual forces of evil" or "evil spirits" in the supernatural sphere. So, as you can see, that term "spiritual" can be applied to both those for and against God. But, if as mortal men and women, it is our desire to be "spiritual", just what does that mean, what does it look like, and how do we get there? I'm sure there are plenty of Christians who do not need the answers to these questions and are satisfied in their salvation alone. But, in my study and meditation on the Word, I cannot ignore all the exhortations and counsel to "grow in the grace and knowledge of our Lord and Savior"; that we are being "built up into a spiritual house"; that we are to "supplement our faith with virtue, knowledge, self-control, steadfastness, godliness, brotherly affection and love -- these are ours and they are increasing to keep us from being ineffective or unfruitful in the knowledge of Christ". And there are so many more reminders that we are to "long for the pure spiritual milk, that by it [we] may grow up into salvation". In Christianity there is an obvious relationship between our spirituality and our salvation experience, yet I'm not sure we give any credence to "becoming spiritual". In our modern culture, it has almost become a euphemism for believing in anything. I have heard everyone from vegans to satanists refer to themselves as "spiritual". Just Google what does it mean to be spiritual and see all the many false ways people can be led astray. But it is important to remember that we are not born spiritual. It is a process that we grow into and must work at maintaining. Yes, we are born in the image of God, who is Spirit, but we also are born into the natural state of man with the desires of the flesh, which are against the Spirit. In fact, Paul tells us in 1 Corinthians, Chapter 3, that even "baby Christians" are not yet spiritual. He writes, "Brothers and sisters, I could not address you as spiritual people, but as people of the flesh, as infants in Christ. I fed you with milk, not solid food, for you were not ready for it. And even now you are not yet ready, for you are still of the flesh. For while there is jealousy and strife among you, are you not of the flesh and behaving only in a human way?" Immaturity and inexperience with walking out our salvation journey will hinder our ability to reach the goal of spirituality. So how do we get there? The spiritual state of a Believer is reached by careful and persistent work in studying the Word and in continuous prayer and relationship with God. It is maintained by obedience and the ability to judge oneself according to the precepts of a righteous follower of Christ. Both the "attaining" and the "maintaining" of a spiritual state come by growing and increasing in the knowledge of Jesus through experiencing Him in an intimate and personal way. And we can only become truly spiritual by walking and living in the Spirit; by growing in the Spirit and keeping in step with the Spirit, who is against the desires of the flesh. To be called "spiritual" is to be able to prove one's ability to walk as the Spirit walks; not in the worldly ways of man. Is it easy to attain? Of course not! Who among us can say they are able to fully walk in Christ's footsteps? Yet, we should not think ourselves unworthy of becoming spiritual. If you proclaim Jesus Christ as your Savior, you are a new creation and are capable of building a foundation upon which you can grow into becoming spiritual -- into the very image of the One you follow. If that is your goal, I would ask you this question -- Are you truly hungering and thirsting after that intimate knowledge of Christ that brings the vital union of your soul and spirit with God? If you are, and exercising your faith in obedience and dedication, then you will be deemed righteous and blessed (Matthew 5:6). And you will be "building up that spiritual house, to be a holy priesthood, to offer spiritual sacrifices acceptable to God through Jesus Christ" (1 Peter 2:5). So, let us not take this designation lightly. It is a serious matter to rightly call oneself spiritual. It is a matter of yielding to the call of God upon our lives, and to passionately seeking an intimate knowledge of Jesus through His Word and experiential encounters with Him in our daily lives. If we can do this, we will begin a journey of being led by the Spirit, and in time, grow and be transformed into His beautiful image. 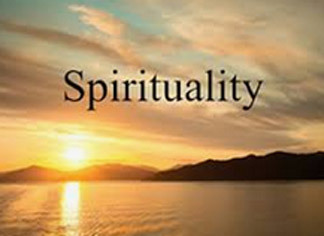 Then we can truly call ourselves "spiritual". Philippians 1:6 "I pray with great faith for you, because I’m fully convinced that the One who began this glorious work in you will faithfully continue the process of maturing you and will put His finishing touches to it until the unveiling of our Lord Jesus Christ."